A special feature last winter was the appearance of Kinley Coyan, a local rancher who is very knowledgable about archeology. He has taken graduate level coursework in archeology as part of a life long interest in the topic. He presented a couple of programs in the museum about Native Americans here in the Big Bend area over the last several thousand years. He used Hallie’s collection of artifacts as well as his own reproductions of arrowheads and other tools as he talked about the history of this area. Kinley is also a world class flintknapper (arrowhead-maker) who can sometimes be found demonstrating his skill on the Stillwell’s porch. You can read about him at flintknappers.com . (He has his own gallery listed.) You can also contact him at mkcattlecompany@bigbend.net. Watch for him again next year at Stillwell’s… it is a special treat to watch him work and hear him talk about the past here in the Big Bend area. He is also hosting the first annual Stillwell Knap-In on October 21-24, 2010. Call the Stillwells (432.376.2244) to reserve a campsite to be a part of this event. You’ll be able to see several flint-knappers, including Kinley, demonstrating their skills. You don’t have to be a flint-knapper to participate in this free Knap-In. (There is no fee for the Knap-In, but the usual camping fees will apply.) Be sure to allow extra days to enjoy the Big Bend National Park as well as more of this beautiful area. We’ve survived another winter season and spring break…it was a busy one! Many folks came during the Trail Ride in February and stayed through Spring Break…more and more folks are staying longer and longer here at Stillwells. We’re working on plans for next year, with new and exciting things to do. We provided shuttle service for folks who floated the Rio Grande…some for a day or two and some for much longer. The Whitfords were here again for the sixth year. They played for dances on Saturday nights. Local folks, Marilyn and Mackey Shackleford gave some Texas Two-Step instructions on a couple of different occasions for those interested in learning to dance the way the Texans do! Interested campers were able to enjoy Sunday morning Gospel music by the Whitfords. They played in the museum most other nights of the week. They were occasionally joined by Omer Mattheiu and Chuck and Barb Schneider. The Whitfords plan to return in 2011…watch this website for their specific dates. We had several special programs by rangers from Big Bend National Park, including information on birds, star-gazing, a park trivia program called “Did You Know?” and “The Good, the Bad, and the Ugly”. A special feature last winter was the appearance of Kinley Coyan, a local rancher who is very knowledgable about archeology. He has taken graduate level coursework in archeology as part of a life long interest in the topic. He presented a couple of programs in the museum about Native Americans here in the Big Bend area over the last several thousand years. He used Hallie’s collection of artifacts as well as his own reproductions of arrowheads and other tools as he talked about the history of this area. We also had some movie nights in the museum, featuring old westerns such as “The Rounders” and “Stagecoach” (the movie that made John Wayne famous!). Speaking of movies, we have a new DVD narrated by Hallie, “Recollections of a Pioneer”. It’s available to view in the museum at your leisure while you’re here at Stillwells, and is also available for purchase. It’s a 18 minute video of the Marivillas Canyon in all its grandeur. Hallie’s comments are almost spiritual, as she reveals her thoughts about this land she loved so dearly. Drop by and try out our new porch rockers…hope to see you soon! 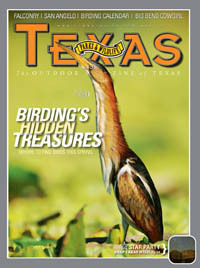 There is a mention in the September, 2008 issue of Texas Parks and Wildlife magazine. Please see the article, titled “No Country for Wimps“.